Dept. Colorado MCL Home Page Ooh Rah! 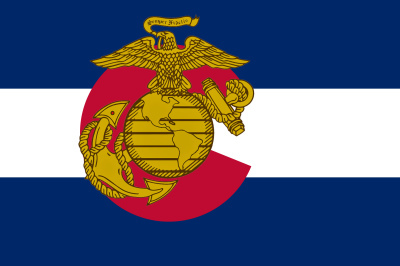 Thanks for visiting the web site of the Colorado State Department of the Marine Corps League! Feel free to look around at the pages of this site. If you are an honorably discharged Marine or FMF Corpsmen and live in Colorado, please consider joining us. That motto "once a Marine, always a Marine" is not just words. You served your country, thank you. Now you can enjoy the comradery of your fellow Marines. Colorado is home to many Marines and the Colorado State Department of the Marine Corps League gives Marines and FMF Corpsmen a chance to be part of an outstanding group of Devil Dogs. The Marine Corps League is comprised of Marines and Fleet Marine Force (FMF) Corpsmen. Our ranks comprise the active, reserves, retired and honorably discharged Marines/FMF Corpsmen with 90 days or more of service. Some of our detachments also have a dedicated auxiliary unit, that welcome all people whom share a interest in the Marine Corps into our ranks as auxiliary members. Below is the link to the state MCL scholarship fund. All application are due by April 1st. Down load the applcation and see if you qualify. Please feel welcome to click the link below and make a donation to the MCL scholarship fund. ​The Marine Corps League is headed by an elected National Commandant, with 14 elected National Staff Officers who serve as trustees. The National Board of Trustees coordinates the efforts of 49 department, or state, entities and the activities of over 1100 community-based detachments located throughout the United States and overseas. The day-to-day operations of the League are under the control of the National Executive Director with the responsibility for the management and direction of all programs, activities, and affairs of the Marine Corps League as well as supervising the National Headquarters staff.